We are in the middle of a 4th of July holiday heat wave here in Massachusetts and this pregnant mama is feeling it! I’m not sure if it’s a combo of this being my third pregnancy or the fact that I’ve never endured a third trimester in the summertime, but I am desperately seeking AC and/or any cold body of water to plunk myself in. Phew! Of all the things I love about summer I have to say the fresh food of the season has to be one of my favorites. Farmers markets are in full swing, gardens are flourishing (my zucchini are taking over my garden currently) and the amount of colorful fruits and vegetables available seems endless. If you participate in a garden or farm share you may be bringing home some new fruits or veggies you may not even know what to do with! Now is the best time to try new foods or try new ways of preparing them so you can enjoy every bite the season has to offer. This week we wanted to deliver you with a staple of the summer backyard barbecue and perfect addition to your 4th of July festivities - and for good reason. It's creamy, spicy and simply delicious. What's more is that it's packed with fresh ingredients that provide you with the nutrients you need to keep you feeling full and satisfied. 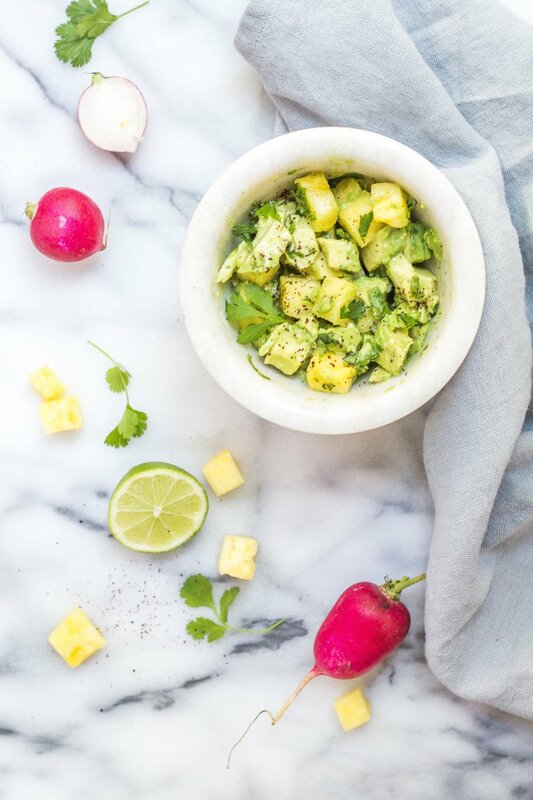 The main star of the recipe, the avocado, is full of the healthy monounsaturated fatty acids that may help lower your LDL (lousy cholesterol) and raise your HDL (healthy cholesterol). Avocados are also an excellent source of vitamin E, a powerful antioxidant that helps keep your hair, skin and nails strong! All perks of a fruit that is super tasty! The second all star in this yummy recipe is the mango. Known for their tropical, sweet taste, mangos offer a variety of nutritional benefits. They are high in vitamins A and C, two vitamins Americans have trouble getting enough of every day, and they are full of antioxidants that help remove potentially harmful substances from the body. Choose a mango that has reddish/green skin and is slightly soft when gently squeezed, similar to an avocado. The major reason this guacamole recipe will help keep you feeling full - and why it's a great snack to satisfy - is because of it's fat and fiber content. As I said, avocados are an excellent source of healthy fats and fiber, to help give you that feeling of fullness keeping you feeling satisfied, longer. If you’ve been following along with our blog, you’ve likely heard me talk about the importance of finding true satisfaction with your food intake. If creamy and delicious with an optional touch of salt and spice is what you're seeking, this guacamole recipe will hit the spot. Place the avocados in a medium bowl and mash with a fork, leaving some large chunks. Add the mango, jalapeno, onion, cilantro, lime juice, salt and black pepper. Please share with us your version of this recipe and if you made any alterations - honestly, there are endless options here (add tomatoes, spice it up with hot sauce, add other fruits (any!) I can’t wait to hear how your guac comes out and what you decided to pair it with!